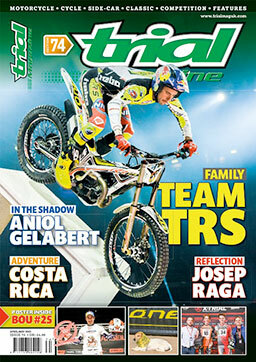 PRE-ORDER CLASSIC TRIAL MAGAZINE ISSUE 21 Now! You can now pre-order at our website: www.trialmaguk.com by going to ShopTrialmag on the dropdown toolbar. Issue 21 of Classic Trial Magazine is our ‘Summer’ edition which will be ready very soon so if you do not receive this subscription only magazine why not Pre-Order a copy now or even take out a subscription! Inside issue 21 you will find all your Classic Trials News, Action, Events, Tests and somuch more for you Classic – Retro addicted trials junkies who need the motorcycle fix. Flashback: The 1981 FIM World Trial Championship from Spain. International: It’s Pre-65 ‘Scottish’ Time. History: A comprehensive look at the 1967 Scottish Six Days Trial through the Camera of Brian Holder. Meeting: Richard Sunter or ‘Sunt’ to Many. Comparison: Three Generations of the Bultaco Trials Machines. Classic Machine: Untold before the full story of the Chapman BSA. Indoor: 40 Years of the Barcelona Indoor. Workshop: Heath and the Steve Saunders Fantic Modifications! 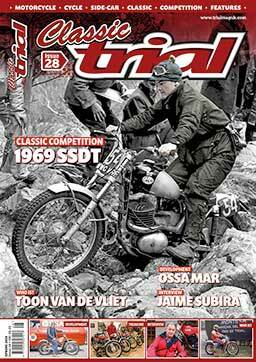 Remember Classic Trial Magazine is only available on subscription – It’s so easy to subscribe just go to www.trialmaguk.com and yes it’s an all English website. Make sure you don’t miss out and get yourself a subscription by contactingClassic Trial Magazine: Mail: lisa@trialmag.com – england@trialmag.com or telephone on Monday or Friday: 01663 – 744766 (Between: 10 – 3 O’clock) Please be patient when calling. RIP Nicky Hayden a racer and a gentleman.